This book is included in our Free Book listing. Shipping charges will apply. OR order below at 85% off. This price includes free Media Mail shipping in the continental US. Remember that special teacher who touched your heart and mind, who inspired you, believed in you, or maybe just gave you a glimpse of what you might achieve and who you might become? This book honors teachers, as well as counselors, coaches, and other special adults in children’s lives, and the impact these special people can have on the young lives they touch. Here are entertaining, inspiring, and moving stories from people of all ages, all professions and all backgrounds. Some are famous—Jimmy Carter, Les Brown, Dave Barry, Shari Lewis, Steve Allen, Joe Paterno, Zig Ziglar, Bernie Siegel, Leo Buscaglia and many well-known educators and authors—while others are ordinary folks with extraordinary stories. The book includes delightful comments from kids around the world with their ideas about what makes a really great teacher. A great “Teacher Appreciation” gift! Wonderfully Accurate and Awe-Inspiring! Written for both teachers and students, this book is ideal for anyone who’s ever felt the impact of another person’s influence on their soul. This book proves that there truly are teachers out there who can inspire a student to live their dreams! 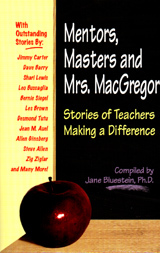 Use your credit card or PayPal account to order Mentors, Masters and Mrs. MacGregor: Stories of Teachers Making a Difference through a secure server online. Ask for an autograph. It’s free, too! Stories of teachers, counselors, coaches, and others who made a difference in students lives. Personal stories and ideas from kids about what makes a great teacher. This book is free. The price covers our shipping cost.